Stuck on the highway? Don't pull off to the shoulder, officials say. Think you can get a good view from a field? Don't drive on grass and start a fire. And be careful of where your GPS might send you, such as on a remote logging road. 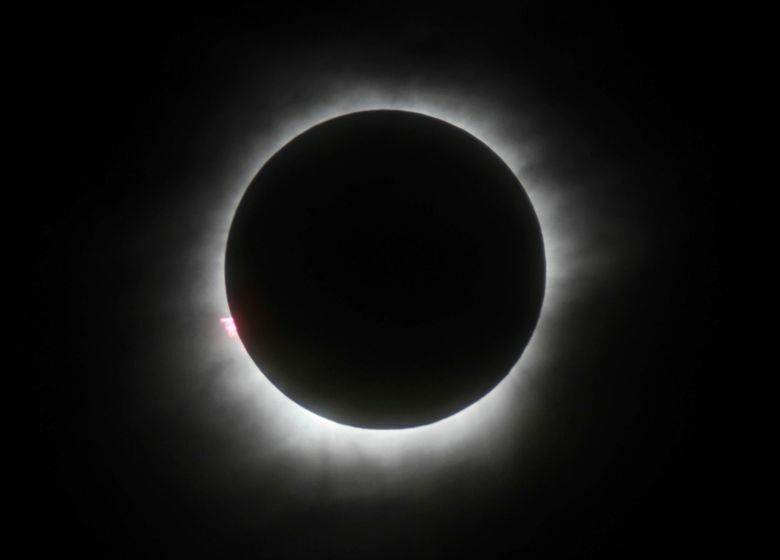 If you’re entertaining the idea of popping in your car really early Monday and racing down to Oregon in time for the eclipse, think again. You’re not the only person thinking that most everybody else will have heeded the dire traffic warnings from both Oregon and Washington, and that you and the other spontaneous types will have the roads to yourselves. And you aren’t the only person who’s pored over maps looking for those little-known, lightly traveled alternate routes on the eastern side of both states. 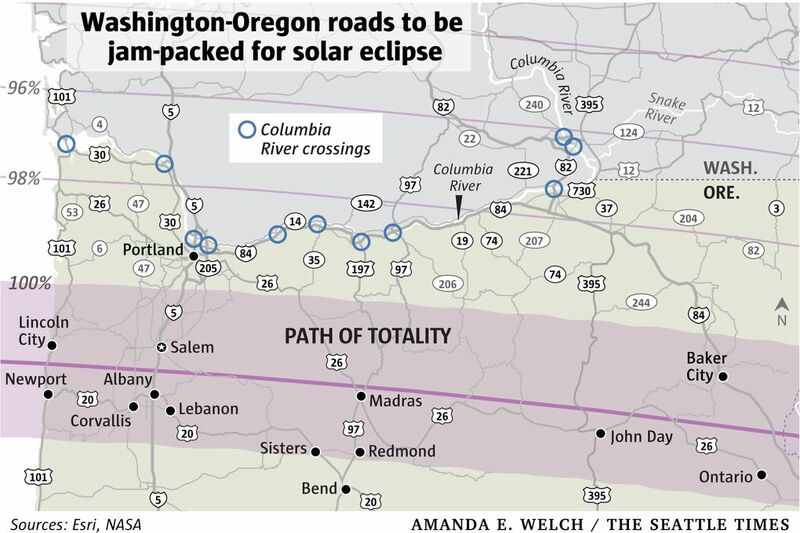 “If you try to come down Monday, no matter how early you leave, you’re already too late,” said Oregon Department of Transportation (ODOT) spokesman Dave Thompson, whose agency has been planning for eclipse traffic for more than a year. 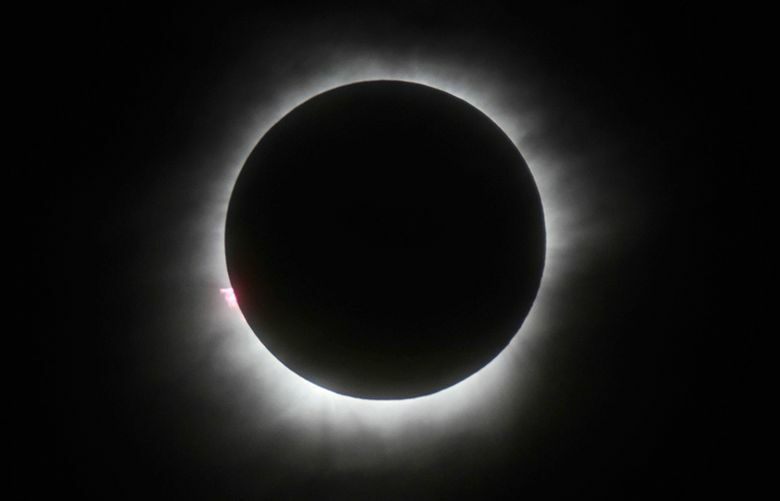 In trying to anticipate what people will do as they head toward the first total eclipse of the sun in the United States since 1979, Thompson and his colleagues have examined “virtually every highway in Eastern Washington and most are narrow, two-lane, curving rural roads” which will not get you into the eclipse’s path with any speed or ease, he said. And even if you were able to get down into, say, Salem or Madras where festivals and events are planned, you would likely not be able to get off the road, Thompson said. The Oregon Museum of Science and Industry, which is staging an event at the state fairgrounds in Salem, is estimating that it will take drivers several hours to get from the Interstate 5 to the fairgrounds a few miles away, he said. Dave House, another ODOT spokesman, said the state is expecting to get more traffic than it’s ever had. And that’s just with the 1 million people they expect after counting the hotel rooms and campsites that have been booked, in some cases, years in advance. There’s no way for anyone to anticipate the number of visitors who will stay with friends or try to wing it, House said. No matter what time you leave, transportation officials in both states urge you to have a printed, hard copy of a map with you. “You never know when you might lose your GPS signal,” said Washington State Department of Transportation spokeswoman Barbara LaBoe. Officials with both transportation agencies said that although they know it will happen, they are pleading with drivers not to pull over to the side of the road as the eclipse approaches. Thompson said some of the worst-case scenarios his agency have anticipated include people pulling over into a field to see the eclipse and accidentally setting it on fire. “Now you’re in the middle of a wildfire that you started,” he said. Another potential and likely scenario is a road with people looking up at the sky as they drive, others pulling over as the eclipse approaches, and others trying to take advantage of the perceived open lanes by trying to race ahead of the sky gawkers.